WASHINGTON -- A U.S. Navy ship sailed near an artificial island built by China in the South China Sea in a long-anticipated challenge to what the Obama administration considers Beijing's "excessive claim" of sovereignty in those waters, a U.S. defense official said Monday. CBS News' David Martin reports a U.S. official says the destroyer Lassen conducted a transit within 12 nautical miles of Subi reef one of the artificial islands created by China. The transit was conducted "without incident" the official said without providing any other details. A Pentagon spokesman, Navy Cmdr. Bill Urban, declined to comment to the Associated Press. The Obama administration has long said it will exercise a right to freedom of navigation in any international waters, including in the South China Sea. The point of sailing a U.S. ship within 12 nautical miles of any of the artificial islands created by China would be to demonstrate the U.S. assertion that they are not sovereign Chinese territory. "Make no mistake, the United States will fly, sail and operate wherever international law allows, as we do around the world, and the South China Sea is not and will not be an exception," Defense Secretary Ash Carter said on Oct. 13. In a statement issued Tuesday, the Chinese Foreign Ministry had some strong word about the U.S. move. "The USS Lassen, without the Chinese government's approval, illegally entered the waters around the reefs," the statement said. "China monitored, followed and warned the vessel, in accordance with the law. The vessel's behavior threatened China's sovereignty and security interests, threatened the safety of residents and facilities on the reefs, and hurt regional stability. "China expresses strong dissatisfaction and firm opposition. China firmly opposes any country damaging China's sovereignty and security interests in the name of free navigation and flyover. "China would firmly react to any deliberate provocation by any country," the statement continued. "China strongly urges the U.S. to immediately correct its mistake." Asked Monday for comment about the U.S. action, a spokesman at the Chinese embassy in Washington, Zhu Haiquan, said China respects freedom of navigation in the South China Sea. "Freedom of navigation and overflight should not be used as excuse to flex muscle and undermine other countries' sovereignty and security," he said. "We urge the United States to refrain from saying or doing anything provocative and act responsibly in maintaining regional peace and stability." State Department spokesman John Kirby said Monday the U.S. would not be required to consult with other nations if it decided to conduct freedom of navigation operations in international waters anywhere on the globe. "The whole point of freedom of navigation in international waters is that it's international waters. You don't need to consult with anybody. That's the idea," Kirby said. He referred questions about specific Navy ship movements to the Pentagon. China's assertive behavior in the South China Sea has become an increasingly sore point in relations with the United States, even as President Barack Obama and China's President Xi Jinping have sought to deepen cooperation in other areas, such as climate change. China claims virtually all of the South China Sea. The Philippines and other countries that have territorial disputes with China in the busy sea have been particularly concerned by China's recent land reclamation projects that have turned a number of previously submerged reefs in the Spratly archipelago into artificial islands with runways and wharves. 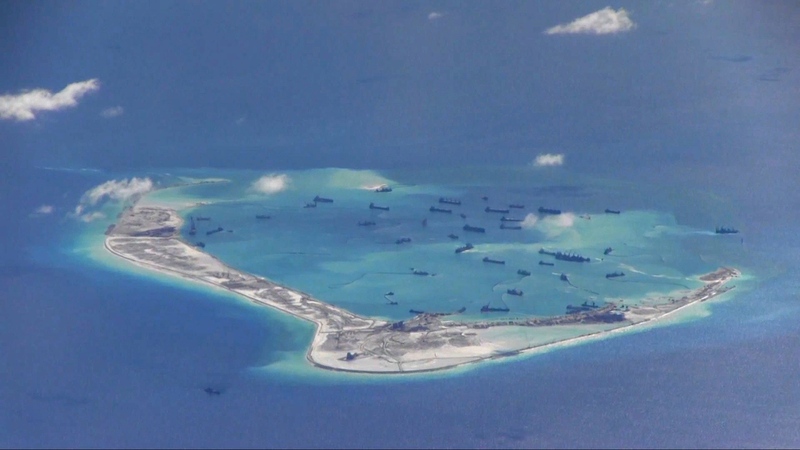 Adm. Harry Harris Jr., commander of the U.S. Pacific Command, has said the South China Sea is no more China's than the Gulf of Mexico is Mexico's.